Betty Morrison, a lawyer’s wife, is flung into the society of an ancient Edinburgh family, the Warrielaws. There’s Neil the Rip, Cora the Siren, Rhoda the Business Woman, and Alison the little Beauty – not to mention the formidable, elderly Jessica and her meek sister Mary. The family all possess unusual gold-green eyes – and harbour a precious and historic jewel, a bauble under constant threat of theft. The alarmed Betty will become a crucial witness in a case that includes mysterious disappearances of gems and people, as well as wholesale murder. 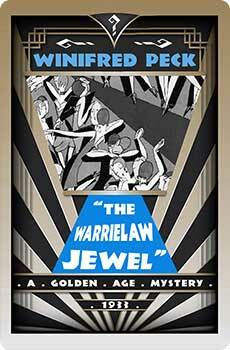 The Warrielaw Jewel was originally published in 1933. This new edition features an introduction by crime fiction historian Martin Edwards.